Mad Science camps offer a daily combination of in-class discovery and exploration, outdoor games and physical activities, and hands-on applications of the scientific principles presented. Mad Science Camps are designed to create an experience that is sure to impress your child. Our camps are fun, exciting, hands-on and entertaining! Mad Science and NASA have teamed up to bring you the excitement and wonder of space in the NASA Space Academy camp. This is your chance to be a rocket scientist! Explore the science involved in rocket construction as you build your own rocket. Use teamwork to complete an important space mission and build a model space station. Explore the farthest reaches of our solar system and create a lunar eclipse in our Mad Science planetary tour. This stellar camp is your ticket to the stars as you journey through the galaxy. Join Mad Science and our Radical Robots for a scientific journey through circuitry and sensors. Explore several different types of robots, from robots that follows lines and sounds to robotic arms like the ones you see in the big factories on TV (well, smaller than that, but you get the picture). You will even play tag with robots that you control! Complete the camp by building your own robot to take home! Shake up a flask of fun in the lab and become a junior chemist! Learn to Recognize chemical reactions and mix up a few reactive ingredients for some sensational results. Check out the colors of chemistry with the power of ph paper and create a stopper-popping reaction. Probe the properties of light and discover some unusual applications of glow-in-the-dark technology. Campers have a blast as they make some crazy concoctions. Take home projects include a reaction tube kit, atomic coins, slippery slime, Professor Beakerdude, and more! This is the Mad Science super science sampler. 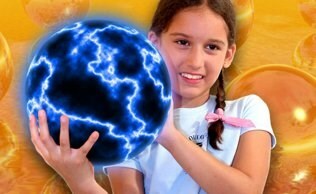 Explore the world of science with a different set of fun science topics each day. 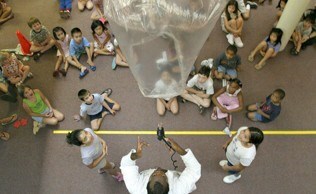 Campers will experiment with super strong magnets and have a "hair raising" experience while learning about electricity. They will play tricks on each other’s senses by experimenting with their taste buds and manipulating sound waves. Kids will investigate light waves, explore the properties of color, and then baffle their eyes by exploring optical illusions. They will also play with unusual science toys to reverse engineer how they work and analyze the amazing properties of slime.